Denethor is a man deep within his grief and constrained by his pride. There is a madness underlying his speech and action, born from many sources but perhaps triggered by the hurt of loss. I also wonder at the seeming glamour of him, where he has a majesty that perhaps diminishes the perception of Gandalf's power. Some of it does come from his lineage, a heritage that interestingly Faramir possesses and Boromir did not. More than most men, Denethor has the potential to be great, as does his surviving son and as does the rightful King of Gondor. We can't completely fault him his pride either, his family has stood as Stewards for generations, all but kings, and they stand as the wall between sides in a conflict that has spanned the ages of Middle Earth. 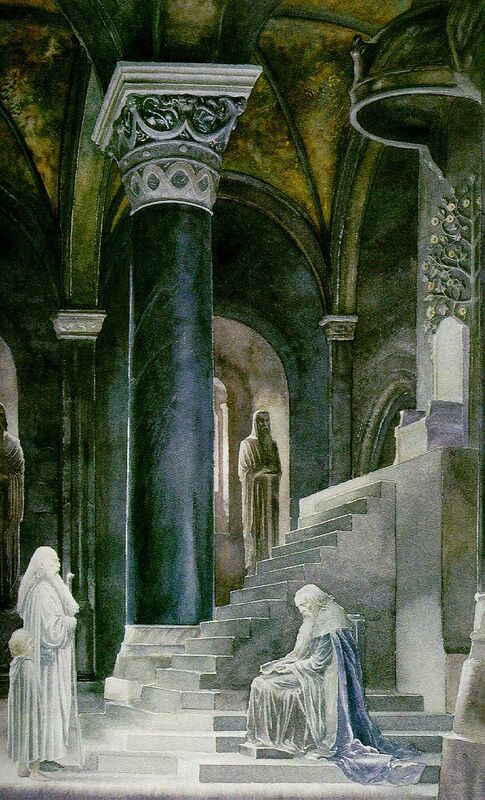 Pippin makes a gamble, swearing himself into the service of Gondor, though he may not have perceived it as so. I wonder if the symbolism of his father's name was deliberate, or something that came together as the story developed. With the depth invested in these stories, I lean towards a deliberate act to give Pippin's father the name Paladin, a title/honorific for a knight renowned for heroism and chivalry. Regardless of actions and destiny to come, right now his sworn service comes with advantages, some possibly helped by the seeming harmlessness of the friendly little halfling. Were he a spy with nefarious intent things would go poorly for Gondor, as it is, just virtue or his friendly nature and connection to rumors of hope, Pippin learns quite a bit that could serve to advantage. In addition to everything we've read, we get a few scenes thrown in here between when Gandalf and Pippin ride off from Aragorn and company. 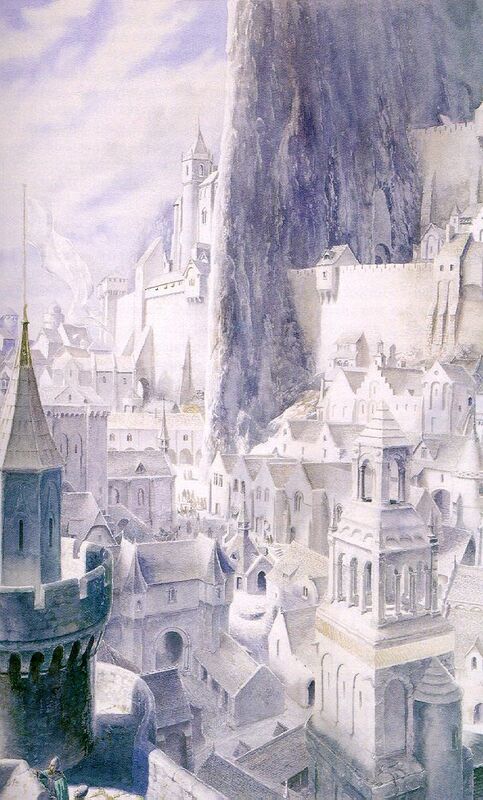 In particular we get the Reforging of Narsil.. which should have happened back when they were gearing up to set out (the shards of Narsil reforged into Andurill), as well as a vision by Arwen that imparts a bunch of (what I believe is) appendix and supplemental material regarding Arwen's future life with Aragorn. It gives us a little more time with Jackson's interpretation of Arwen and Elrond. It's not my particularly favorite scene, it lacks the weight it deserves for the emotional conflicts present. But then we get back to the business at hand, with Pippin and Gandalf riding into Gondor. I cannot fault the city as shown to us on the screen. It definitely is a thing of grandeur. The tree is more specifically brought to our attention, but not exactly in relation to it's dying state, just that it is a tree of Kings and Denethor is not a king but is a proud man. Most of the lead up to the meeting between Gandalf, Denethor, and Pippin is stripped away... and in this case I think it was a good decision. The result is a very strong scene, and one that reveals more Denethor's pride, anger, and grief. I think it serves to the narrative benefit to cut out Pippin's social successes among the soldiers and townfolk. Instead what we get are some very powerful, and a few lightly humorous, moments between Pippin and Gandalf that might be otherwise lost.